188 pages | 33 B/W Illus. This book is the most thorough exploration to date of the many ways in which a wild creature has been absorbed, reimagined and represented across the ages in all of the major art forms. The authors consider not only how the identity of sharks in the natural environment became incorporated into a cultural environment but also how sharks came to be considered the most feared creatures in the open oceans as a consequence of this incorporation. Yet sharks are especially important in helping to maintain a balance that is essential to the health of the oceans. The book begins with a treatment of the three sharks at the top of global shark-attack files from scientific, economic and environmental perspectives. 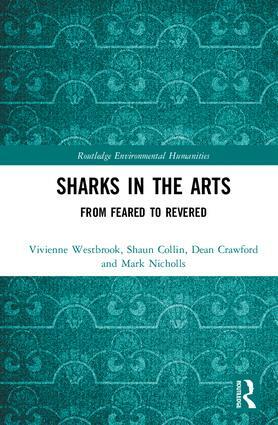 Subsequent chapters engage with cultural representations of sharks in poetry, drama, art, novels, screenplay adaptations and films. Through an exploration of the ways in which sharks have been represented in human culture through the centuries, this book alerts the global community to the importance of sharks as a common cultural heritage. It aims to change perceptions of sharks so that they can become more revered than feared. The authors of this book argue that an increased understanding of sharks should lead to the development of better strategies for shark and human interactions. This book will be of great interest to researchers and students of the Environmental Humanities, Cultural History and the Arts. It is also excellent supplementary reading for courses in Zoology and Marine Science. Vivienne Westbrook is an Adjunct Professor at The University of Western Australia and a member of St. John’s College, Cambridge, UK. She has authored numerous works of cultural history and is currently focusing on literary representation within the Environmental Humanities. Shaun Collin is a Professor of Neuroecology within the Oceans Graduate School and Deputy Director of the Oceans Institute at The University of Western Australia. He has published extensively on the subject of how aquatic animals, including sharks, detect and process environmental signals. Dean Crawford is an Emeritus Professor of English at Vassar College, USA and the author of Shark (Reaktion) and The Lay of the Land (Viking-Penguin). Mark Nicholls is a Fellow of St John's College, University of Cambridge, UK. He currently serves as Librarian, Tutor and Supervisor in British History, and was President of the College from 2007 to 2011.